I want to know how to soften the edge of an elliptical mask, assuming that's possible. I drew an ellipse over an image. Converted it to a mask and the result gives me what I wanted. However, I'd like to soften the edge of the mask so that it fades out and doesn't provide a hard edge. I've tried a number of experiments with load selection and refine selection but can't find the combination of tools that give me what I want. Is it possible to soften the edge of a mask and if so how would I go about it? Have you tried applying a Gaussian blur effect to the mask layer? That should do the trick and is nondestructive, to boot! P.S. 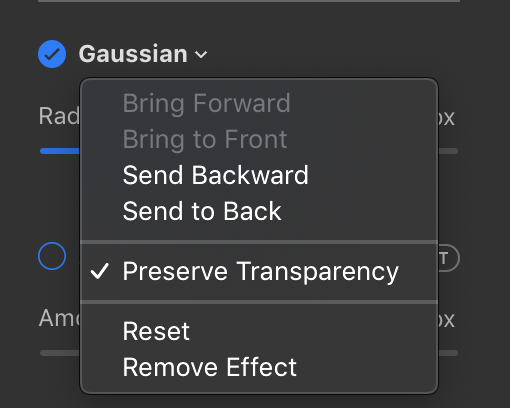 To avoid softening around the edges of the mask, you'll need to choose the Preserve Transparency option in the Gaussian effect's pop-up menu, like in the screenshot below.